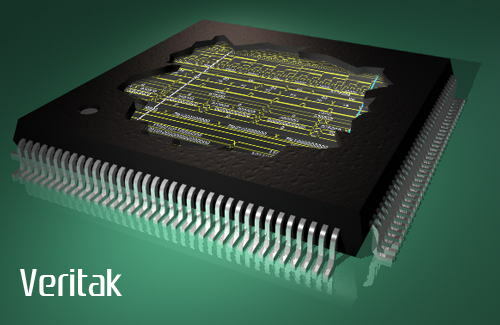 Veritak is a Verilog HDL Compiler/Simulator that supports the major Verilog 2001 HDL features. 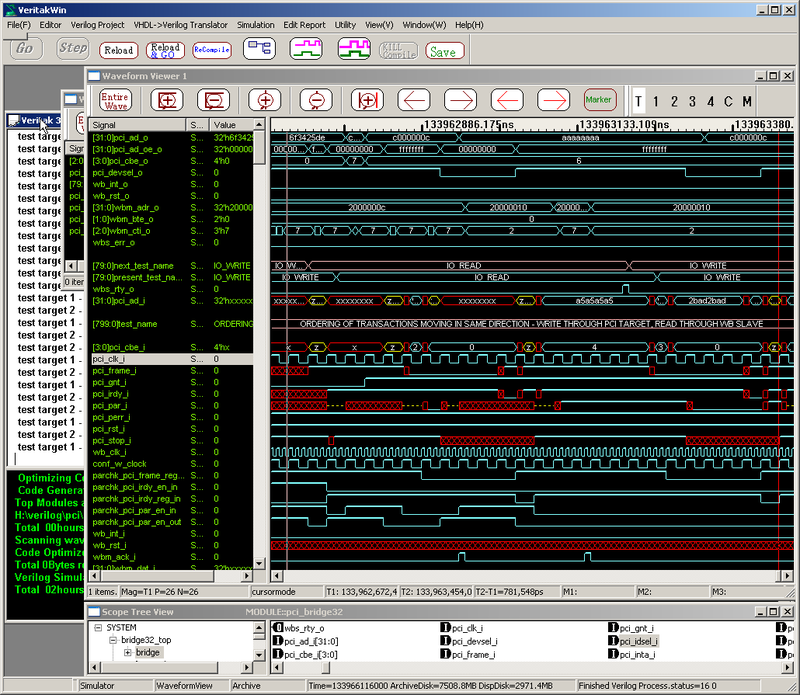 It provides an integrated environment, which includes a VHDL to Verilog translator, a syntax highlighting editor (called Veripad), a class hierarchy viewer, a multiple-waveform viewer capable of handling a gigabyte vcd files, source analyzer, and more -- it is available for Windows XP/2000/2003/Vista32/Vista64/Windows7 32bit/64bit.. 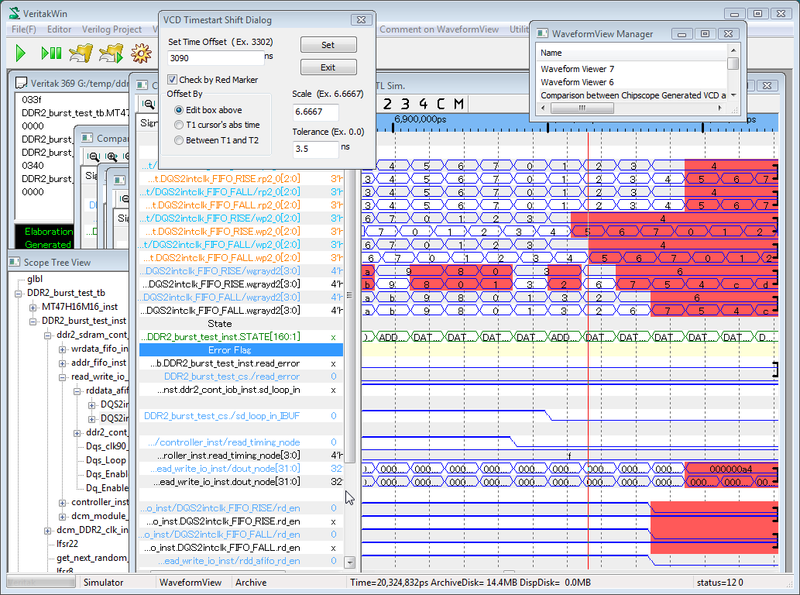 If you are looking for a fast Verilog HDL simulator with a full-function GUI for professional use, while maintaining an extremely low price, this is it. You can try Veritak at no cost for two weeks. Enabled Dual-Display with Windows7 -64bit ready. Screen snapshot below from our new 3.73C. Screen snapshot below from our new 3.57A. Screen snapshot below from our new 3.50B. Enabled wildcard search for wavefoms and scope tree in overall. 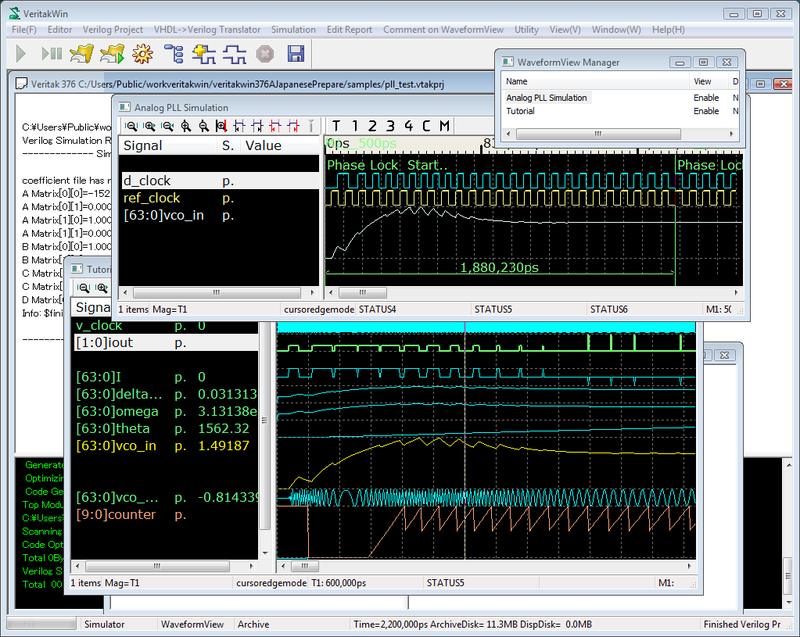 Updated User Contributed Linear System Simulator is included, using VPI with full VC++ sources. Great thanks to Vanheesbeke Stefaan. Veritak addresses to Notepad++ using notepad++ plugin designed for Veritak. (Check sync cursor and sync waveforms as below.. This release enables "auto-grouping function " in VCD project with comments on WaveformView. This release supports "VCD projects" with waveform viewer capable of handling a gigabyte VCD files at a time.. This release supports meta-copy of waveform view. You can copy & paste waveform view to your Word/Excel/Visio diretly without degradation of graphics quality. Especially in Visio, you can edit individual shape by ungrouping or grouping the shape. Enabled selective save for waveform view. This release also includes Library Compilation speed improvement. Our new tool bar Icons below and Veritak product Graphic shown above have been developed by "Tim Ruetz (caiaq.de)". The Veritak waveform viewer is now 64-bit enabled. This means you can now view long simulations, well over 2GB, as a waveform. You can view large vcd files (several hundreds mega bytes in size) as well. The largest IP core in opencores can be in viewed in full using the Veritak giga byte viewer. Easy to Use. Graphical User Interface ("GUI") provides a productive environment for both novices and experts.. Unlimited number of source code lines. Full history of all signals is saved, with compression. Can dump current memory contents to Veritak console..
Jun.28.2011 Veritak Version 3.84F Released. Jun.12.2011 Veritak Version 3.84E Released. Jul.29.2010 Veritak Version 3.80E Released. Jul.19.2010 Veritak Version 3.80E Released. May.28.2010 Veritak Version 3.80A Released. May.10.2010 Veritak Version 3.79E Released. Apr.6.2010 Veritak Version 3.79B Released. Mar.10.2010 Veritak Version 3.77E Released. Mar.9.2010 Veritak Version 3.77D Released. Mar.8.2010 Veritak Version 3.77C Released. Mar.7.2010 Veritak Version 3.77B Released. Jan.18.2010 Veritak Version 3.75A Released. Sep.4.2009 Veritak Version 3.73D Released. Sep.1.2009 Veritak Version 3.73C Released. Aug.8.2009 Veritak Version 3.73A Released. Aug.5.2009　Veritak Version 3.72A Released. Jul.7.2009 Veritak Version .3.71C Released. Jul.5.2009 Veritak Version .3.71A Released. Jun.29.2009 Veritak Version .3.69C Released. Jun.26.2009 Veritak Version .3.69B Released. Jun.24.2009 Veritak Version .3.68B Released. Jun.23.2009 Veritak Version .3.68A Released. Jun.20.2009 Veritak Version .3.67A Released. Jun.19.2009 Veritak Version .3.66A Released. May.31.2009 Veritak Version 3.65A Released. May.30.2009 Veritak Version 3.64A Released. May.2.2009 Veritak Version 3.62A Released. Apr.29.2009 Veritak Version 3.61A Released. Apr.24.2009 Veritak Version 3.60B Released. Apr.19.2009 Veritak Version 3.60A Released. Apr.17.2009 Veritak Version 3.59C Released. Apr.11.2009 Veritak Version 3.59B Released. Apr.7.2009 Veritak Version 3.59A Released. Mar.31.2009 Veritak Version 3.57A Released. Mar.30.2009 Veritak Version 3.56A Released. Mar.29.2009 Veritak Version 3.55B Released. Mar.27.2009 Veritak Version 3.55A Released. Mar.21.2009 Veritak Version 3.54H Released. Mar.11.2009 Veritak Version 3.54G Released. Mar.8.2009 Veritak Version 3.54F Released. Jan.24.2009 Veritak Version 3.54E Released. Jan.12.2009 Veritak Version 3.54D Released. Jan.3.2009 Veritak Version 3.54B Released. Jan.1.2009 Veritak Version 3.54A Released. Dec.17.2008 Veritak Version 3.53C Released. Dec.4.2008 Veritak Version 3.53B Released. Nov.26.2008 Veritak Versin 3.53A Released. Nov.15.2008 Veritak Version 3.52C Released. Nov.13.2008 Veritak Version 3.52A Released. Nov.12.2008 Veritak Version 3.51C Released. Oct.5.2008 Veritak Version 3.50B Released. Sep.2.2008 Veritak Version 3.50A Released. Sep.1.2008 Veritak Version 3.49G Released. Aug.27.2008 Veritak Version 3.49D Released. Aug.21.2008 Veritak Version 3.49C Released. Aug.4.2008 Veritak Version 3.49A Released. Jul.26.2008 Veritak Version 3.48A Released. Jul.17.2008 Veritak Version 3.47B Released. Jul.8.2008 Veritak Version 3.47A Released. Jul.2.2008 Veritak Version 3.46C Released. Jul.1.2008 Veritak Version 3.46B Released. Jun.14.2008 Veritak Version 3.45C Released. Jun.13.2008 Veritak Version 3.45B Released. Jun.6.2008 Veritak Version 3.44C Released. Jun.5.2008 Veritak Version 3.44B Released. Jun.5.2008 Veritak Version 3.44A Released. May.16.2008 Veritak Versin 3.43M Released. Apr.25.2008 Veritak Version 3.43L Released. Mar.21.2008 Veritak Version 3.43F Released. Mar.20.2008 Veritak Version 3.43E Released. Mar.13.2008 Veritak Version 3.43D Released. Mar.11.2008 Veritak Version 3.43B Released. Jan.23.2008 Veritak Version 3.42A Released. Jan.20.2008 Veritak Version 3.41K Released. Dec.19.2007 Veritak Version 3.41J Released. Dec.6.2007 Veritak Version 3.41I Released. Nov.20.2007 Veritak Version 3.41F Released. Oct.30.2007 Veritak Version 3.41E Released. Oct.24.2007 Veritak Version 3.41C Released. Oct.23.2007 Veritak Version 3.41B Released. Oct.16.2007 Veritak Version 3.40A Released. Sep.6.2007 Veritak Version 3.39E Released. Aug.30.2007 Veritak Version 3.39D Released. Aug.29.2007 Veritak Version 3.39C Released. Aug.22.2007 Veritak Version 3.39A Released. May.30.2007 Veritak Version 3.36E Released. May.23.2007 Veritak Version 3.36D Released. May.23.2007 Veritak Version 3.36B Released. May.20.2007 Veritak Version 3.36A Released. May.19.2007 Veritak Version 3.35E Released. May.13.2007 Veritak Version 3.35B Released. May.2.2007 Veritak Version 3.34H Released. May.1.2007 Veritak Version 3.34G Released. Feb.27.2007 Veritak Version 3.29C Released. Feb.5.2007 Veritak Version 3.28B Released. Jan.11.2007 Veritak Version 3.26A Released. Jan.1.2007 Veritak Version 3.25B Released. Mar.6.2006 Veritak Version 2.05A Released. Mar.2.2006 Veritak Version 2.04A Released. Jan.18.2006 Veritak Version 1.98A Released. Jan.5.2006 Veritak Version 1.97A Released. Nov.14.2005 Veritak Version 1.86A Released. Nov.13.2005 Veritak Version 1.85 Released. 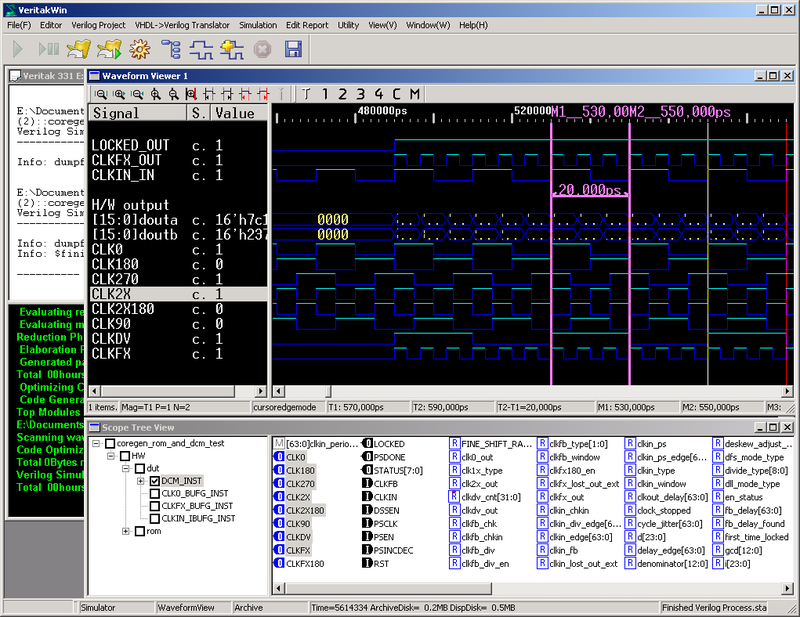 May.7.2005 Design of Analog PLL and Simulation by Verilog HDL released. May.6.2005 Evaluation of Openrisc CPU released. Analysis of CRC generator released. May.1.2005 Veritak Version 1.57A Released. Apr.26.2005 opencores Project YACC started. Apr.25.2005 Veritak Version 1.56A Released. Apr.19.2005 Veritak Version 1.54A Released.